Dr. Francis Collins, head of the Human Genome Project, is one of the world's leading scientists -- yet he is also a man of unshakable faith in God and scripture. Dr. Collins has resolved the dilemma that haunts everyone who believes in God and respects science. Faith in God and faith in science can be harmonious -- not separately but together, combined into one worldview. For Collins, science does not conflict with the Bible, science enhances it. 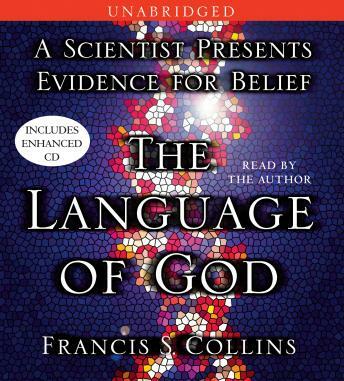 The Language of God makes the case for God and for science. Dr. Collins considers and dismisses several positions along the spectrum from atheism to young-earth creationism -- including agnosticism and Intelligent Design. Instead, he proposes a new synthesis, a new way to think about an active, caring God who created humankind through evolutionary processes. He explains his own journey from atheism to faith, and then takes listeners on a stunning tour of modern science to show that physics, chemistry, and biology can all fit together with belief in God and the Bible. The Language of God is essential for anyone who wonders about the deepest questions of all: Why are we here? How did we get here? And what does life mean? Although I didn't find Dr. Collins' argument for the existence of God compelling, I nonetheless enjoyed the book. It contains a surprising amount of information about the current state of molecular genetics, which was entertaining. While I don't share his religious views, I thought that he did a good job of explaining why science and religion are not mutually exclusive of one another. Additionally, Collins very succinctly demonstrates why intelligent design and creationism simply don't hold any intellectual water. I don't understand why one reviewer thought that Collins came off as "pompous." I found him to be thoughtful and earnest. Let me begin by saying that I have not the slightest sympathy for the theory of evolution and I cannot imagine ever believing that it is so. From first grade through my first graduate degree I attended conservative religious schools that opposed the teaching of evolution. However, most Christian students do not share my experience. Those raised on both fundamentalist religious teaching and mainstream biology often feel forced to choose between what they perceive as faith and knowledge. Many either decide they cannot continue to believe in God or conclude that they must abandon all confidence in science. Collins sees this as unnecessary and tragic. Regarding origins, it is the role of science to answer "when" and "how," he says, and the role of faith to answer "who" and "why." Having studied and taught the Bible for 50 years, I agree with this assessment, although I do not believe in evolution myself. The author puts forth a thought provoking and engaging thesis on the compatibility of science and religion. He builds his arguments around sound empirical and personal observations that let the reader ponder similar circumstances in one’s own life. Although I didn’t personally agree with all of his conclusions, or rather some of the statements leading to certain conclusions, he never the less conveys one of the most reasonable and quietly passionate cases for his main idea. Dr. Francis Collins, head of the Human Genome Project, does an admirable job of demonstrating that science and faith can be complementary and potentially synergistic. He masterfully argues in favor of the reasonability of faith verses atheism or agnosticism. He does a fair and balanced job of defining the pros and cons of four competing theories of creation: 1) Darwinian Evolution, 2) Young Earth Creationism, 3) Intelligent Design, and 4) Theistic Evolution aka Bio Logos. His discussion of The Moral Law and human altruism is fascinating. However, Collins does diverge by singing songs, plus indulging in a long, technical discourse into the hunt for the Cystic Fibrosis gene and Human Genome mapping. Between the sentimental song lyrics, and technical genome jargon, there was a bit of a language barriar for this reader, which distracted from the interesting discussion of the Language Of God. I didn't hear any evidence.Someone needs to explain to the scientist what evidence means-evidently he does not know. Also, folk songs do not belong in any serious book.Avoid ,if possible. Pompous scientist uses flimsy evidence to justify believing in God. Couldn't get past disc 1. When one starts out with a position and occasionally makes statements in support of it without examples to base his conclusions and chides his reader, as though he is lecturing to children, I am disappointed and even at times offended. I thought someone so educated could provide evidence/conclusions without the blinding clutter of faith in a particular religion (as I hoped a scientist would). He did not. If only he could have moved quickly to his evidence before he sharing these generalizations and adopting the condescension of the first CD I may have listened to more. This lecture reinforced for me that religions are still, sadly, institutions that keep us separated from understanding and loving one another (that they are by and large Elitist institutions that automatically keep the rest of the world out). My own search for proof continues.